Fitting dental implants is a specialty that requires talent, training, experience, and knowledge about the latest dental implant technology. Not every dentist is equally qualified to perform this procedure. That’s why it’s so important to inquire about your dentist’s level of experience and training before allowing someone to fit your smile with dental implants. What are all the steps required for getting dental implants? What experience do you have fitting dental implants? What specific type of dental implant training do you have? Which dentist will be performing the procedure? Does your staff provide all the steps of the dental implant process? Are all procedures performed in this dental office? How long should I expect the entire dental implant process to take? Dental implants have been recognized as an outstanding solution for replacing your missing teeth. 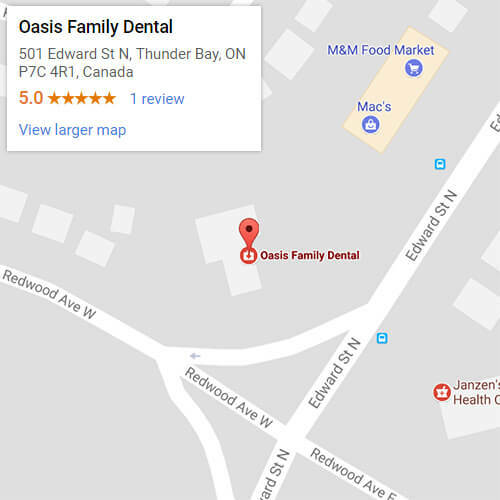 Dr. Elaine Chow and her dedicated team of professionals at Oasis Family Dental in Thunder Bay, ON have the necessary training and experience to place your dental implants. During your initial consultation with Dr. Chow, we’ll perform a full dental examination including x-rays and other tests to determine the health of your jawbone and gums. If you and Dr. Chow decide that dental implants are the best solution for restoring your smile, then we’ll get the process started. Sometimes Dr. Chow concludes that patients require one or more additional procedure to prepare for successful dental implant surgery. In these cases, we will set up a treatment timetable that includes any necessary preliminary procedures. Bruxism, excessive grinding of the teeth—treatments include stress reduction techniques and fitting the patient for a mouth-guard. Limited jawbone density, the jawbone beneath the implant site is not wide enough to support an implant—bone graft surgery is the most common treatment for this condition. Gum disease, an infection that causes pain, bleeding, and swelling in the gums—treatments include effective dental hygiene, regular dental checkups, deep cleaning from your dentist, regenerative procedures, and gum graft surgery. With bone graft surgery, a small section of tissue is taken from the roof of your mouth and surgically attached to your jawbone to provide enough mass to support the dental implant. This minimally invasive surgery is performed by Dr. Chow in our Thunder Bay office. Gum disease is a serious threat to your smile which afflicts over 47% of Americans over 30. In the early stages of gum disease, it can often be treated with by removing the hardened tartar which the infection feeds on. Dr. Chow aqchieve this through a deep cleaning procedure called scaling and root planing where the tartar is scraped away from your teeth and roots. Bruxism is a stress-related condition, so relation techniques such a biofeedback are often key part of strategies for counteracting this condition. In more sever cases, we can design a mouth-guard to help protect your teeth from excessive grinding while you are sleeping. For more serious cases of gum disease, we might elect to use flap surgery where Dr. Chow cleans the tartar out of the deep pockets that have formed inside the gums. The gums are then sutured back together. We also provide gum grafts for the most advanced cases of gum disease. Similar to bone graft surgery, infected gum tissue is cut away and replaced with tissue from the roof of your mouth. Sometimes, antibiotics are also used to fight gum disease. The first step in the dental implant process is surgically placing the dental implant fixture. During this procedure, Dr. Chow will make a small hole that allows the fixture to be inserted in your jawbone. You will want to take it easy for a few days after your dental implant surgery. Set aside some time to rest and avoid strenuous activities for at least 72 hours. There will be some pain and swelling around the surgical site. You can expect some bleeding in your mouth following the surgery, so make sure you change your gauze regularly. Avoid hot drinks such as coffee and tea and plan on eating only soft food for the first few days. After that you should continue to avoid hard or jagged foods which might aggravate the surgical site while it is still sensitive. During your recovery, the bone tissue in your jaw will bond with the titanium fixture. Titanium is a biocompatible material which enables it to bond with your bone tissue just like the roots of your natural teeth would. This remarkable process is known as osseointegration and it’s the reason why dental implants are able to provide a level of ease and comfort that’s comparable to your natural teeth. Once the fixture has become fully assimilated with your jawbone, it’s time for Dr. Chow to attach the abutment and the crown. The crown is designed to look and feel just like your natural teeth. Before you know it, you’ll be ready to eat carrots and celery again. no-obligation consultation with Dr. Chow. Your fully-restored smile is closer than you think.